Deb writes under the pen-name "Introspective" for InfoBarrel. You can follow her on Twitter, Google+, Linked-in, and Instagram @DebW07. "We are Riders on a Mission . . ."
Rocket power is an animated television series about a group of friends who live in the fictional beach community of Ocean Shores, California. The main characters are Otto and Reggie Rocket (brother and sister), and their friends Maurice "Twister" Rodriguez and Sam "Squid" Dullard. All four enjoy outdoor activities such as skateboarding, surfing, bicycle riding and other sports. The animated series aired on Nickelodeon from August 16, 1999 through July 30, 2004.
Credit: Introspective Pics.Reggie, (Regina Rocket) is an 11-year-old aspiring author and publisher, who writes a blog - type magazine called "The Zine." Described as a "born leader," she is also extremely athletic and even once won a figure skating competition without taking a single lesson. Otto (Oswald Rocket) is Reggie’s 9-year old brother who is a sports enthusiast and perfectionist. He is extremely driven, self-confident, and is the leader of the group. His confidence often leads to mischief and sometimes even trouble but Otto always manages to work things out. Although his athletic skills are savvy, his expertise in the classroom leaves much to be desired. "Twister" (Maurice Rodriguez) is Otto's best friend and fellow skateboarder, and he prefers to be called Twister instead of Maurice (he doesn't like his name). Twister tends to take more risks on his skateboard, being somewhat of a "daredevil." He is also quite the videographer and always has his camcorder on, capturing the most "awesome" moments. Although they are all good friends, Twister enjoys picking on Sam. Sam "Squid" Dullard is the fourth member of this close-knit group and a bit different from the rest. Sam is very smart, however, not athletically gifted. He is the only one from the group to use a long surfboard when surfing; the other three are quite proficient on the shorter boards, which are much more difficult to maneuver. Sam does excel as a goalie in hockey and this gives him much enjoyment. But not as much enjoyment as pancakes give him, Sam loves pancakes! Sam enjoys hanging with the group, although sometimes it may be difficult because his mother is extremely over-protective; she even forced him to skip the fifth grade! Ray Rocket is Reggie and Otto's father. He was a widower for many years, losing his wife, Danni, in a surfing accident. He married his second wife, Noelani Makani, in 2004 in the cartoon episode titled "Rocket Power: The Big day." Ray is the owner of the Shore Shack on Ocean Shores Pier, a burger joint/restaurant and surf shop. The Shore Shack is part of a two story Mission Revival building next to a music store, shaped like an old fashioned radio. Ray is a surfer who drives a "vintage Woodie," (1962 Mercury). Ray is a laid-back, easy going type person, with an interesting phobia; he has an irrational fear of poodles. Credit: Introspective Pics.Tito Makani is Ray’s best friend and business partner, who makes hamburgers and French fries at the Shore Shack. He is Hawaiian, a surfer and self-proclaimed philosopher. His name Tito comes from the Latin, meaning "big fellow" or "defender." His cousin, Noelani Makani (Rocket) married Ray, and he also has a nephew who occasionally visits from the Hawaiian Islands, by the name of Keoni Makani. Lars Rodriguez is Twister's older brother, who often badgers him and the rest of the group. Lars is extremely competitive and is Otto’s biggest rival. Whenever Lars and his friends compete against the Rocket Power group they usually lose, and this often irritates him. But sometimes Lars is friendly with the group and he will participate in events with them, such as after Otto was injured snowboarding, Reggie, Twister and Sam asked Lars to fill in for him in a competition. While he does pick-on Twister and the others, Lars does love and care about his little brother. He is also very respectful of adults. Some of the other characters include Eddie Valentine, the son of a magician couple, he wears an outfit made-up of a hooded cloak and a "scary" mask. Oliver Van Rossum, very intelligent, his main priority was academics until he met Sam. Officer Shirley is a police officer in Ocean Shores who always keeps the peace. She enjoys a friendship with Ray, whom she refers to as "Big Ray." Trish and Sherry are Reggie's best friends, surfers, and members of the state volleyball team. Mackenzie Benders is a five-year-old rascal who continually annoys the group, and also has a crush on Twister. Conroy Blanc is the owner of the skate park "Madtown," where the group skates. He is also a teacher at the local school. Merv and Violet Stimpleton are the Rockets' neighbors. Doug Dullard is Sam's estranged father, who appears to be a workaholic. Full of good intentions, he often tries to be the "cool dad" but is often oblivious to Sam because he’s always taking care of business on his cell phone. Noelani Makani Rocket is Tito's cousin and married to Ray. Lt. "Tice" Ryan is the Coast Guardsman and lifeguard who lives to enforce the rules. Keoni Khaloa is Tito's younger cousin from Hawaii who occasionally visits Ocean Shores. Professional Skateboarder Tony Hawk played himself in the Rocket Power episode "Enter the Hawk." He skates and snowboards with the group in a converted ice factory located in an industrial district of Ocean Shores called The Hawk's Nest. His character also makes a cameo appearance in another episode, "Home Sweet Home," where you can see him exiting a bus after Otto. "We are riders on a mission, action kids in play position. Rocket Power! Rocket Power! We are riders on a mission, action kids in fun condition. Prepare to count down . . . Rocket Power!" "Rocket Power: Race Across New Zealand" is the first full length movie about the kids from Ocean Shores, California. After raising enough money, they enter "The Junior Waikikamukau Games" competition in New Zealand, but they are unaware of the painful memories this will bring back for Ray. "The Island of the Menehune" was another full length movie which aired on Nickelodeon July 19, 2002 and released onto VHS and DVD in 2004. The kids accompany Ray Rocket and his business partner Tito Makani to Oahu for a reunion of Tito's extended family. "The Big Day" was the series finale and was about Ray Rocket's wedding to Tito's cousin Noelani . 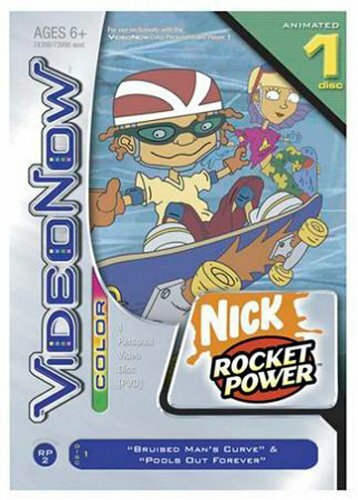 Enjoy the fun of Rocket Power anytime with Video Now. Loved, loved, loved watching this show with my older daughter! Now I will be singing that song in my head all day. Thanks for a fun trip down memory lane! This was my oldest daughter's favorite show and she still has all of the Rocket Power novelty items that she collected over the years. She graciously allowed me to photograph some of them for this article. Thanks so much for the comment, MMM and enjoy singing the Rocket Power theme song! LOL I loved this show! Oh the memories of watching this when I was younger (albeit probably still too old to admit I watched it). Nice article! You're never too old for cartoons! Thanks so much puckhead! I LOVE Rocket Power! Great read!! I loved Sam! This was so fun to read! My kids loved Rocket Power! I forgot all about it until I read this. Thanks Jack, my kids loved RP too!